Want Magic Keyboard with Touch Bar? Here are two concepts that envision how Apple could port the new Touch Bar feature from the 2016 MacBook Pro to the Magic Keyboard for iMac and Mac Pro users to enjoy. Apple’s outing of the new MacBook Pros and their Touch Bars ended months of speculation that the new notebook computers would somehow incorporate a touch-screen above the keyboard. Those rumors were, of course, accurate, as it turns out, but they will surely now give way to more rumors that Apple will bring the same technology to the iMac and Mac Pro via a newly revised Magic Keyboard. Apple’s external, wireless Magic Keyboard is now ripe for such technology being added in order to bring the same touch-based interaction to Macs that aren’t the new MacBook Pros. Whether Touch ID would also make the jump to a wireless keyboard is debatable, mainly because of the possible security issues that may arise, but we have to assume that Apple is looking at a way to bring the Touch Bar to its external keyboard. Quite how it does it, though, we’re not really sure. Interestingly, we have been made aware of two concepts that attempt to answer the question of what a Magic Keyboard would look like with a Touch Bar atop it, but both have approached the situation very differently. We love both, too, so we can’t decide which makes most sense to us. The first, shared with us by designer Sangho Lee, is based around a detachable “Magic Touch Bar” that would be placed above the existing Magic Keyboard and then connect to it via Lightning port. We’re not sure Apple would go for the idea of another external accessory joining a keyboard and mouse, but this approach does mean the Touch Bar could be used without the keyboard, theoretically. A more likely solution is for a revised Magic Keyboard to be released, and that’s what Bas van der Ploeg has in mind, too. His design is basically the existing Magic Keyboard with a Touch Bar built in, and it looks just perfect. It’s certainly the most Apple-like solution, we feel. It is, of course, possible that Apple won’t be allowing the Touch Bar to leave the MacBook Pro, but we think that would be a mistake. Hopefully, Apple does, too. Still don’t know why the magic keyboard doesn’t have a number pad. I’d be happy if they offered the wired, extended keyboard with the Touch Bar. Apple has more desktop Macs then laptop Macs, I hope they decide to release a new keyboard with Touchbar support. I do not know whether the Touch ID’s Secure Enclave mechanism could function in a box separate from the computer. This is something that should be discussed. Having the Touch Bar without Touch ID would be suboptimal. At the very least, I think this points to a new external keyboard rather than a Touch Bar attached via the Lightning connector. I dock my MacBook Pro when at home so the reality for me at least is that whilst I love the new touch bar it’s going to be hidden away most of the time. I would be all over a keyboard that allowed me access to it whilst docked. Although not sure I could do without my number pad if they only did it on the smaller version. There are all sorts of wired and BT numeric keypads available. Apple sells a Belkin BT model on their store, and MacSales has several models. Some of ’em will even give your F13-F16 keys. 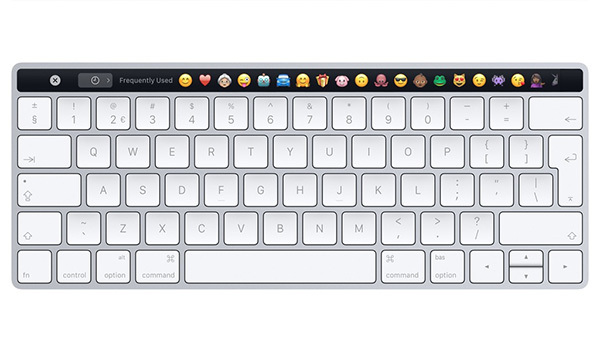 It would only make sense, to add the Touchbar to a new Magic Keyboard for the rest of the Mac line. The software is already there, in the new update. A no brainer, if apple doesn’t, that a shot in the foot move. There are a lot of number pads add on devices, for the Accountants of the world, wireless, and usb. No need to add that to a functioning keyboard for the masses. Another device with mor battery issues to plague pro users. Apple is certainly moving towards the “lite” user category. 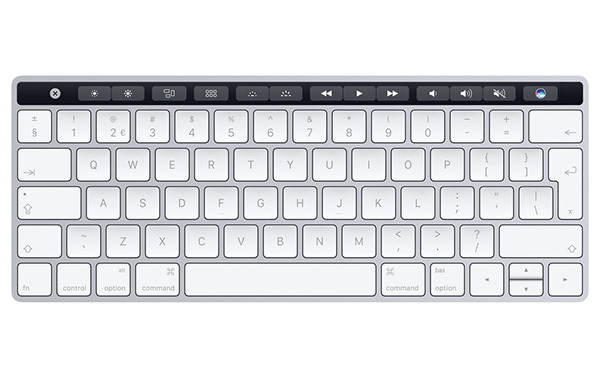 TouchBar on a wireless keyboard with TouchID and black backlit keys would be a amazeballs. I wouldn’t mind having a USB Type-C connector to recharge a built in battery or just run it wired. For InDesign users, the keypad is a part of the workflow for using paragraph style shortcuts. It’s pretty much a necessity, if your formatting large amounts of copy. I would be gonzo over a wired, extended keyboard with a Touch Bar.